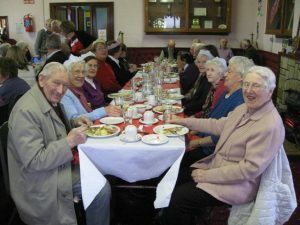 The Christmas party begins with a meal organised by the Community Care volunteers who cook the food and serve it to the guests. After the meal the tables are moved away, the band sets up its gear, and the dancing starts. Several people add their singing voices to the proceedings. You will see some of our senior members enjoying themselves at the party if you go to Parish Photo Albums. The Community Care group works very hard to put on a great party. You will also see some of the members of the group in the gallery photos. The newsletter for Sunday 21st April 2019 has been added to the 2019 Newsletters page. Click HERE to access the newsletters. Now you can read the PARISH NEWSLETTERS on your smartphone. Windy all day today but danger period is 11 pm Friday until 9 am Saturday morning. Waterford has been given a yellow warning, but neighboring counties are on a more severe orange warning for wind. Dunhill and Fenor Parish updated their cover photo.